Web 2.0s are simply free blogging platforms. Most properties allow for a pretty crazy amount of freedom including URL modification, ability to place images and video, contact forms and a ton of other goodies. Those are great because you basically use the authority and trust of these established domains. Yes you are using a subdomain and your page Authority will start with zero, but there is something important to remember. These properties build authority very quickly. It only takes a few links to any web 2.0 and it goes from a PA 0 to a Pa 25 + or higher. The other great thing about web 2.0 links is, that you are essentially getting the most relevant link imaginable and you also have $0 recurring cost. Relevancy is a major determinator on how powerful the link can be and a Web 2.0 gives you the control necessary to craft the perfect link for your site. It's simple, the more relevant the link, the more trust it is going to send to your site. This will in turn increase your rankings. 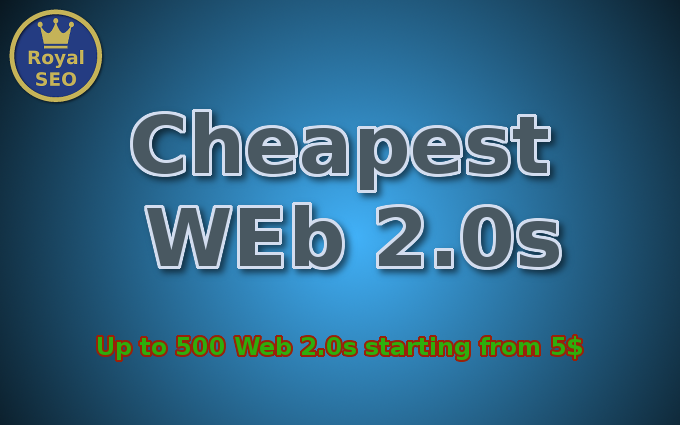 With this service your not getting one Web 2.0, your getting up to 500. Our Web 2.0s are perfect to increase the trust of your tier 1 links and lay a solid tier 2 foundation, giving the necessary strength to your first tier to boost your website to #1 in Google. We don't recommend to build our service directly to your site, except your project is made to churn n' burn. The turnaround time is between 4-7 business days.